Domain Mondo's weekly internet domain news review (NR 2018-09-02) with analysis and opinion: Features • 1) EPDP Struggles, 2) Other ICANN news: a. New gTLD .WEB Updates: Ruby Glen (Donuts) & Afilias, b. DNA & ICANN, and more, 3)a. IDNs--Who Needs Them? b. Afilias Inc., c. Centralnic, and more, 4) ICYMI: a. Facebook & Genocide, b. Egypt, c. Cybercrime & Blockchain, 5) Most Read. ICANN EPDP Team Meetings this week: Tuesday Sep 4, and Thursday Sep 6, 13:00 UTC, 9am EDT. Non-members of the EPDP Team can follow the EPDP meetings via Adobe Connect: https://participate.icann.org/gnso-epdp-observers, or audio cast via browser or application (e.g.,iTunes). Editor's note: each EPDP meeting's links to key documents, transcripts, MP3 audio and Adobe Connect recording, will be posted in UPDATES below (as made available by ICANN--note that links to EPDP meetings' transcripts are usually posted on the GNSO calendar within 24 hours). See also EPDP Team wiki, mail list, Temp Spec, and EPDP Charter (pdf). 9/6 Mp3, Adobe Connect Recording, Chat transcript (embed below). Notes and action items from EPDP Team Meeting 9/6 here. Editor's note: Little of substance was accomplished at the EPDP team meeting on September 4, 2018. The EPDP team appears to be drowning in dysfunction and lack of direction. EPDP team members have been asking, repeatedly since August 7, for GDPR training which ICANN has yet to provide even though the GDPR was published in May 2016, and training was provided by other California corporations for their respective stakeholders long before the GDPR became enforceable on May 25, 2018. Some "additional considerations and materials" for Tuesday's meeting here. Adobe recording of 9/4 meeting, MP3, chat transcript (pdf). Registries Stakeholder Group (RySG) rationale for removal and onward referral of the contents of Appendix C of the Temp Spec (highlighting added) here (pdf) not approved. Notes and action items here. Terri Agnew (ICANN staff): "And, Kurt, this is Terri. If you're speaking it looks like your line is still muted." Kurt Pritz: "That’s because it was still muted. So Alex, you sort of alluded to a proposed wording, do you have that? And, you know, it’s late here so I don't know if my coffee’s kicked in." Aug 30 transcript p. 6, supra. Milton Mueller (NCSG): "Yes, so again I think we are very much going down a rabbit hole here that is completely unnecessary. The problem that we have with 4.4.2 as well as 8 and 9 is that it’s really an access issue; it’s not an ICANN purpose issue. So the problem we have with these so-called legitimate interest lists is that they are trying to incorporate those external third party legitimate interests into a definition of the purpose of ICANN's collection and display of the data which is just a mistake. If we could separate those two things very clearly we could come to an agreement. If you think you're going to accommodate access concerns by defining third party interests as part of ICANN's purpose then we, you know, our stakeholder group is never going to accept that because it is, you know, making the confusion that the data protection authorities told us not to do very explicitly, very clearly and repeatedly that the third party interests, even if they're legitimate and even if they would eventually produce access to the data, should not be confused with ICANN's purpose. And this is what we are persistently doing and that’s our main concern with the many items in Section 4 of the temp spec. Aug 30 transcript p. 7, supra. Ashley Heineman (GAC, U.S.): "... So I’m going to cautiously agree with Milton, at least in part. I think what may have led us astray here is kind of commingling purpose and interest and so I don't have precise wording at this point but I agree with at least exploring the idea of at least separating out these concepts and exploring perhaps, you know, having them addressed elsewhere, perhaps Appendix A, Section 4. But I’m starting to understand the arguments here and I think fundamentally it’s because we’re confusing two concepts that are quite different. So I’ll stop there ...." Aug 30 transcript p.10, supra. Alan Woods (RySG): "... I’m not sure that trying to polish up individual sections in this way is getting us – is getting us very far again, reading all the comments from people such as Thomas in the chat. Completely agree, it’s cutting off an awful lot of other aspects and I think it [Temp Spec] just needs a rewrite as opposed to a polish. Aug 30 transcript p.15, supra. Marc Anderson (RySG): "... I think, you know, the drafting of this [Temp Spec], you know, there was an intent to, you know, the intent here was to, you know, to sort of, you know, bolt on some GDPR compliance to the existing system. You know, and so just sort of taking what's there and redlining it isn't going to – isn't going to be a successful endeavor." Aug 30 transcript p. 17, supra. Terri Agnew: "Kurt, this is Terri. You may still be muted." Kurt Pritz: "I know and I was – first it was really funny and second of all, it was really insightful." Aug 30 transcript p. 17, supra. Marc Anderson (RySG): "... I don't think that the, you know, the way the conversation is flowing right now where we’re sort of jumping around different sections of the temporary specification and just sort of debating them ad hoc is moving us towards done. You know, and given how short a timeframe we have, you know, I think we need to focus that up a little more ..." Aug 30 transcript p. 27, supra. Terri Agnew: "And, Kurt, this is Terri. Please check your mute. Actually, Kurt, it looks like perhaps your audio’s dropped from the Adobe Connect site?" Kurt Pritz: "Yes, can you hear me now?" Aug 30 transcript p. 27, supra. Alan Greenberg (ALAC): "I believe 4.4.8 [Temp Spec] tries to conflate too many things and the wording therefore becomes completely untenable." Aug 30 transcript p. 27, supra. Chat 30 Aug 2018: Alan Woods (RYSG): "full rewrite of all the sections is necessary was my point- not polish what is there." Editor's note: a "full rewrite of all the sections is necessary" -- that, in a nutshell, is also what is so wrong with the EPDP's project plan and work plan (which impliedly presume the Temp Spec just needs to be fine-tuned or "polished"). UPDATE ICANN v. EPAG Domainservices, GmbH: EPAG’s Comment on ICANN’s Plea of Remonstrance (English translation) (pdf). NOTE: Personal identifiable information has been redacted by ICANN. Original German here. Indian regulators call for European-style rules on big tech, focused on privacy and protecting local firms from competition--NYTimes.com: India Pushes Back Against Tech ‘Colonization’ by Internet Giants. 90 Days of GDPR: Minimal Impact on Spam and Domain Registration | recordedfuture.com. Fear mongers forced to eat shorts over spam swamping claims - GDPR and no Whois hasn't caused catastrophe | theregister.co.uk. ICANN org's Legislative / Regulatory Report Q4 FY18 (pdf) 28 Aug 2018 (announcement). 40th International Conference of Data Protection and Privacy Commissioners, side event 25 October 2018, by EDPS and EDBP. 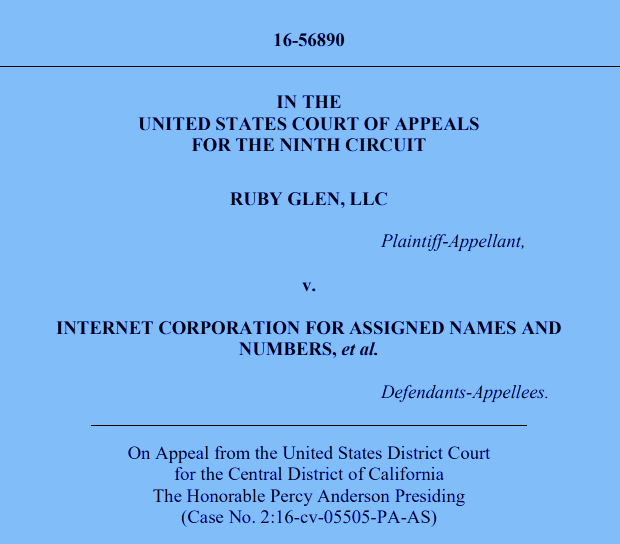 ORAL ARGUMENT Oct 9, 2018: Case 16-56890: Ruby Glen, LLC v. ICANN (Ruby Glen, LLC [Donuts affiliate] appeals the district court's Fed. R. Civ. P. 12(b)(6) dismissal of its diversity action against Internet Corporation for Assigned Names and Numbers, seeking to temporarily enjoin ICANN from conducting an auction [for new gTLD .WEB]. The appellate briefs are here. See also 2018 Reconsideration Requests – Status Update – 29 August 2018 reconsideration-requests-status-2018-29aug18-en.pdf [pdf, 55.9 KB]. Editor's note: not to mention that ICANN, by virtue of the above, is violating its own Articles of Incorporation and the provisions of IRC 501(c)(3). 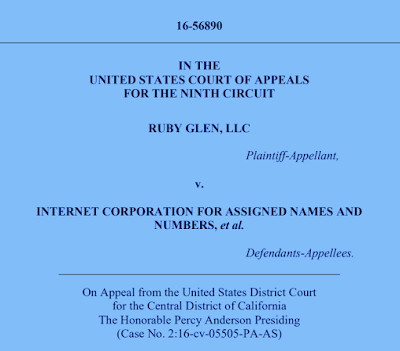 Remedies might include filing a complaint with the IRS, or the Attorney General of the State of California for initiation of, or authorization to file, a legal action pursuant to federal (U.S.) and state (California) law for involuntary dissolution of the Internet Corporation for Assigned Names and Numbers. ICANN: incompetent, corrupt, unfit. UPDATE: go here, here, and here for more on the sordid history of ICANN & the DNA. c. The New ICANN Fellowship Program | ICANN.org: "... Future fellowship cohorts will consist of 45 participants per ICANN meeting, a 25% reduction from years past. Of the 45 slots, seven (7) will go to Fellowship mentors. 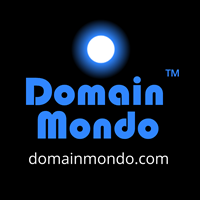 We will uphold and enforce the rule which states an individual can only serve as a fellow a total of three instances ..." See also ICANN Pays Senior VP Sally Costerton Secret Contract $$$ | DomainMondo.com. d. Nothing of import: Minutes (pdf) of ICANN Board Accountability Mechanisms Committee (BAMC) Meeting 02 Aug 2018; and Agenda of BAMC meeting 04 Sep 2018.
e. Internationalized Domain Names | ICANN.org: Internationalized Domain Names (IDNs) enable people around the world to use domain names in local languages and scripts. Editor's note: see the next item below. Nobody Needs Arabic Domain Names | muscatdaily.com 26 Aug 2018: "The Telecommunications Regulatory Authority (TRA) has been offering Arabic language domain names since 2012, but luckily, it does not seem that anyone in Oman has made the mistake of actually using one ... Almost ten years ago, ICANN, the global authority for regulating domain names, announced that it would allow the registration of top-level internationalised domain names written in local languages and scripts other than the Latin alphabet ... nobody seems to be using them. Contrary to what was argued by the proponents of [IDNs] ... We have had web content written in the Arabic language before Arabic domain names came out, and we continue to do so without using these domain names ...."
Editor's note: we (the global internet community) did not need 1200+ new gTLDs either, but that didn't stop ICANN. "formally established a new corporate parent entity, Afilias, Inc. of Delaware, USA. Afilias plc of Ireland is now a wholly owned subsidiary of Afilias, Inc. Afilias further announced the relocation of its global corporate headquarters to Horsham, PA [a suburb of Philadelphia], the current offices of its operating subsidiary Afilias USA, Inc."
Why move from Ireland (part of the EU) to the U.S.? "Afilias’ two largest customers, Public Interest Registry (the .ORG registry operator) and GoDaddy (the world’s largest domain name registrar), have US headquarters. These trends, coupled with recent favorable US tax changes, make Afilias’ US presence important in maximizing its future growth." Afilias is a privately-held legal entity, formed in September, 2000, by a consortium of nineteen ICANN-accredited domain name registrars, including Tucows Inc. Afilias recently replaced Neustar as the registry services provider for Australia's ccTLD .au, and is currently in litigation against Neustar over India's ccTLD .in. Afilias, (see 2)a. above) was the second-highest bidder for new gTLD .WEB and has been contesting the delegation of .WEB to the winning bidder, Nu Dot Co, financed by Verisign which has an agreement with Nu Dot Co for subsequent assignment of .WEB. Centralnic (domain: centralnic.com) reportedly is the 11th largest domain name registrar globally by generic top-level domain volume and among the top five new gTLD backend registry service providers supporting over 100 top-level domains (TLDs). Oh, the penny stock delusions of a new gTLDs true believer! d. Who’s Behind the Screencam Extortion Scam? | KrebsOnSecurity.com: "The truth is we may never find out who’s responsible ..."
e. WIPO Center informal Q&A concerning the GDPR as it relates to the UDRP: In preparing a UDRP complaint post-GDPR, how can a trademark owner conduct a WhoIs search/access the domain name registrant’s details?--wipo.int. f. Why are abandoned domain names dangerous? They are low-hanging fruit for attackers, who can use them to access sensitive email or customer data--csoonline.com. a. Facebook, Myanmar and Genocide: "... the most important global case study regarding the power and potential toxicity of social media; you have to look at Facebook’s enabling role in the Rohingya genocide ..."--datatrekresearch.com. See also U.N. calls for Myanmar generals to be tried for genocide, blames Facebook for incitement--reuters.com. b. Internet Censorship: Egypt's Sisi signs new law tightening government control online--Law imposes hefty fines, up to five years in prison for those who administer websites deemed to harm national interests.--aljazeera.com. c. Cybercrime & Blockchain: 4 ways in which blockchain technology will address the problem of cybercrime | techbullion.com: "DNS is effective but it is partially centralized. Blockchain can prevent denial of service attacks since it would decentralize the DNS."